Members of the Blossom Harp Ensemble band that are raising funds to travel to France this July. 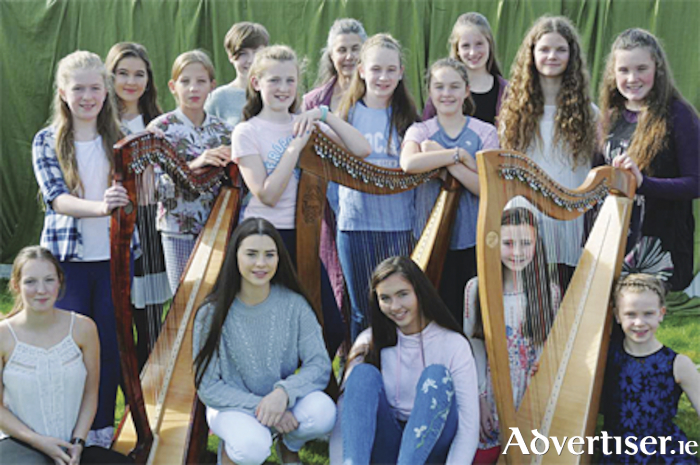 A fundraising concert will be held in Ballinasloe Town Hall Theatre on Thursday, June 28 at 8pm for local harp band, Blossom Harp Ensemble, to preform at the 35th Harp Festival in Brittany, France this July. In Moore community centre every week local girls between the ages of ten and sixteen have been learning the harp with their teacher Lizzie Affolter. There they learn beautiful pieces such as Eleanor Plunkett and Inis Oir and lively tunes like Ryans Jig and Terry Teehans. In 2014, Ms. Affolter decided to create a group from her harp players called Blossom Harp Ensemble. The sixteen harpists on stage are said to be spectacular, taking inspiration from previous famous players such as Mary O Hara and Kathleen Watkins. The concert will be in aid of funding the trip to France where they will showcase their Irish talents to a large musical audience. This plans to be an enchanting evening of beautiful music and a chance to see the wonderful harpists playing together. For tickets (priced at €12 ), call the booking office on 090 9646540 or go to www.ballinasloetownhall.com or come along on the night.